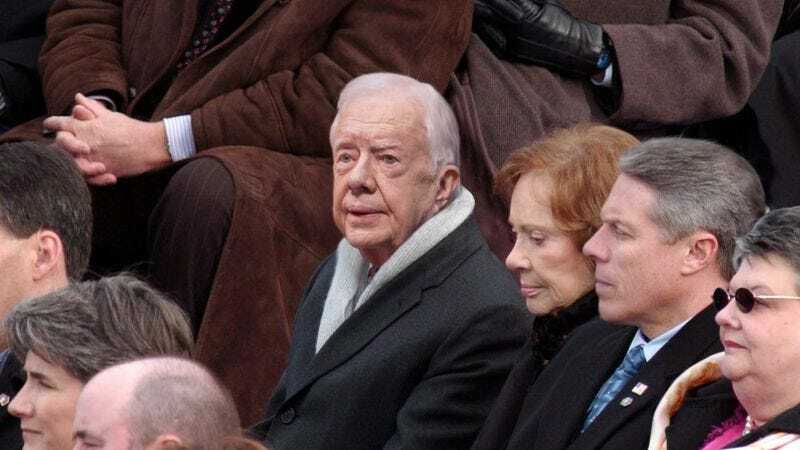 WASHINGTON—Carefully weighing the pros and cons of each option from his seat onstage at Donald Trump’s inauguration, former president Jimmy Carter is, according to late-breaking reports, currently contemplating dying right here and now. “Maybe now’s the time to go,” the 92-year-old reportedly thought to himself Friday, pondering whether to continue viewing the ongoing ceremony for the incoming president or simply release his tenuous grip on existence and pass to the other side. “I could slip away right now, or maybe wait until the middle of the inaugural address. Or I could keep watching the proceedings and then return to my home. Hmm.” At press time, Carter had shifted his gaze upward from Chief Justice John Roberts to a strong beam of light that seemed to be bathing his body in a bright, warming glow.